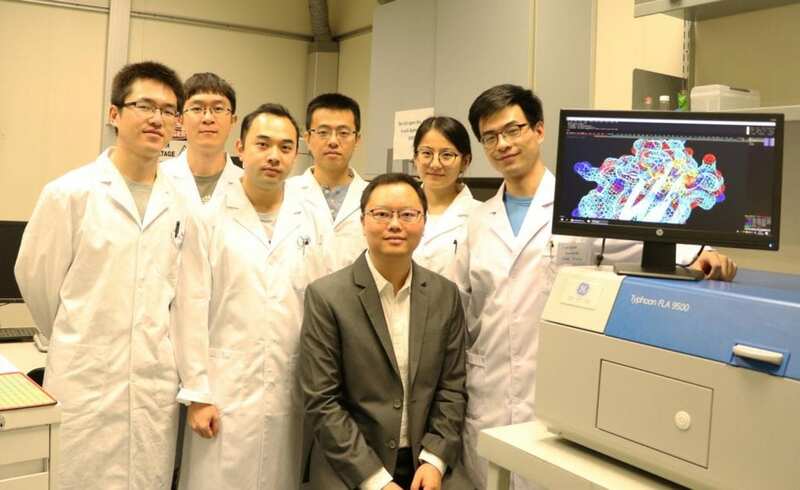 A research team led by Dr. Xiang David Li from the Department of Chemistry at The University of Hong Kong (HKU), in collaboration with scientists from Tsinghua University in China, The Rockefeller University, and The University of Texas MD Anderson Cancer Center in the United States, developed the first chemical inhibitors against a novel therapeutic target for treatment of acute myeloid leukemia (AML), a fast-growing cancer of bone marrow and blood cells. The findings were recently published in a top-class scientific journal — Nature Chemical Biology. A patent on the development and application of the inhibitors has been filed by Dr. Li and his team members. Cancer is traditionally believed to be associated with genetic mutations — changes in DNA sequence — caused by various factors such as smoking and exposure to radiations and toxic chemicals. These adverse alterations in DNA give incorrect instructions for genes to produce their proteins, and thereby mess up normal function of a cell and make it grow and multiply uncontrollably to become cancerous. The research in the past decades has, however, revealed that DNA is not the sole player in this process. A type of proteins called histones, around which DNA is packaged, can function as master switches for gene expression — that is, to determine which sets of genes in a cell should be "ON" or "OFF". Cancer can often be the result of these switches gone wrong. In cells, histones carry a diverse variety of chemical marks, which contain essential information to ensure every gene to be expressed precisely — at the right time, to the right extent. Among the key players in this mechanism of gene regulation are histone "readers", a class of proteins that recognise specific marks on histones and "translate" them by turning the expression of genes up or down accordingly. It is now believed that new therapies may be developed by targeting these readers to reset gene regulatory programs that go awry in cancer. In fact, a couple of compounds targeting histone readers have demonstrated promising results in clinical trials. At the centre of Dr. Li's current research is a new class of histone readers, which share a characteristic structural domain called YEATS. It was recently uncovered that ENL, a YEATS domain-containing protein, specifically 'reads' a histone mark called acetylation, resulting in the faulty activation of cancer-promoting genes in human acute myeloid leukemia (AML) cells. Blocking the recognition of ENL YEATS domain toward the histone mark has therefore been proposed as a new strategy for the treatment of leukemia. The key to success of this strategy is to develop chemical inhibitors targeting ENL. "It's a big challenge," said Dr. Li. "As no chemical compound was shown to target YEATS domain, we must come up with a brand-new design." Enlightened by a crystal structure showing how a YEAT domain recognises the histone mark, Dr. Li's team designed a series of molecules to target a unique mode of interaction discovered at the recognition site. After several rounds of optimisation, an ENL inhibitor with good specificity and potency was developed. Treatment of human AML cells with this inhibitor successfully suppressed the expression of a number of cancer-promoting genes. Moreover, the inhibitor demonstrated an enhanced effect when applied together with the anti-leukemia experimental drugs, suggesting a potential combinatory therapy strategy by simultaneously inhibiting ENL and other well-characterised anti-leukemia targets. This study has therefore opened a new avenue for the treatment of this life-threatening disease. "It is really exciting to have the first-in-class ENL inhibitors, but we still have a long way to go before we can make a drug to cure patients with acute leukemia" says Dr. Li. "We will be continuously exploring the therapeutic potential by inhibiting ENL in acute leukemia, as well as other types of cancers caused by "misreading" of ENL toward the histone marks." Nature Chemical Biology is a top-class international scientific journal publishing original research from the expanding community of chemical biologists.